Our Superheros bring their own professional massage chair and can set-up in any conference room or cubical. Individuals will enjoy feel relaxed and rejuvenated after our therapists work on their neck, shoulders, back, arms, hands and temples. Our Superheros can still bring their own professional massage chair but the therapist can also “float” around the room if the massage chair is wanted. This is ideal for people that want to socialize at events or continue working without leaving their workstation. 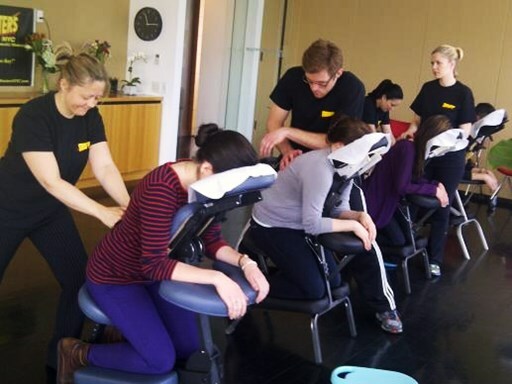 Our Superheroes bring a professional massage table to the office or event. This massage is perfect for people that want to lay down but still be modestly draped or clothed. Clothed Table is ideal for people that want to totally relax and need ​more lower back, body or legs worked. Proven to reduce stress, relax and calm the nerves of tense or fatigued employees. A calming and comforting touch provides a physical and mental rejuvenation for those employees engaged in time sensitive mentally challenging projects. Current Medical research (University of Miami’s School of Medicine) indicates that a basic 15 minute chair massage not only decreased job stress but significantly increased alertness and work productivity. Ideal for workers that develop the “kink in the neck or shoulders” or headaches due to overuse syndrome on the phone, computer workstation, or have “lifting/bending/carrying” type jobs. The perfect experience for the overachievers that have a difficult time relaxing. Treating your employees to a weekly/monthly or occasional massage will show your employees that you appreciation them for all their hard work and help boost morale in the workplace!